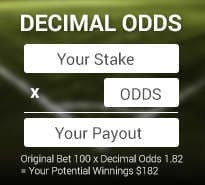 Decimal Odds Explained - What Are Decimal Odds? Decimal odds are the most common way online bookmakers present their odds to customers. Decimal odds are often called European odds, as they are most commonly used by sports bettors in Europe, Australia, and Canada. They are simple to understand, making them a favorite across the world for bookmakers and sports bettors.